It’s kind of strange, but when I was little, May was my favorite month. I say strange because typically a kid’s favorite month has something to do with when they get presents—the month of their birthday or December. As I grew older, though, I found a new reason to love May besides beautiful flowers. Every year on the second Saturday of the month, people all over the world celebrate Fair Trade Day. It’s a moment to come together and recognize that the dominant model of exploitative trade can cease being the norm. 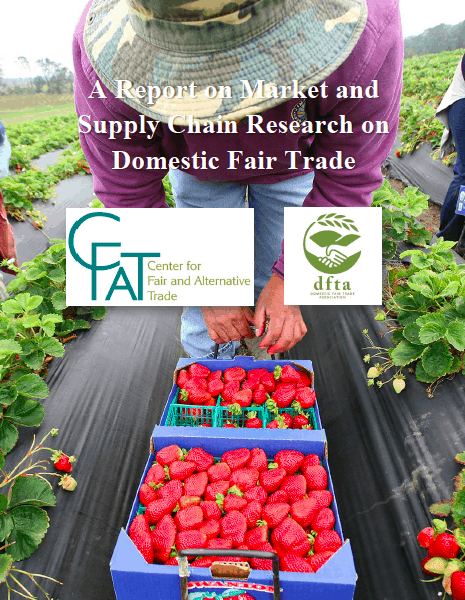 This year in honor of Fair Trade Day, the Domestic Fair Trade Association (DFTA) released a brand new report, in partnership with the Center for Fair and Alternative Trade (CFAT), called A Report on Market and Supply Chain Research on Domestic Fair Trade. Read CFAT & DFTA’s New Report! This report is the first to compile key research on the potential of domestic fair trade as a market and consumer category. With this new publication, farmers, farmworker organizations, retailers, brands, advocacy organizations, and more can see the true value of committing to domestic fair trade. With so many different labels now used on food and agricultural products, many question whether labels still carry any value. Is there still a purpose in labeling? Our new research, “suggests that domestic fair trade products must be labeled” (7). Product labels are still, “the top choice as a source of information, with a brochure or retail display being a close second” (10). Additionally, “Over 80 percent of consumers look to both the product package and store signs to learn about a company/product’s social or environmental commitments” (27). Our report indicates that responsible labeling can still have a significant effect on informing the public about fairness and sustainability of agricultural products. This report demonstrates that there is a need for increased knowledge of the concept of domestic fair trade. For example, “the media discusses concerns relevant to domestic fair trade, but does not regularly use the term” (17). Since domestic fair trade is a holistic approach to improving the agricultural system, increased education could help breakdown one of the key barriers to purchasing sustainable products: consumers “don’t know what social or environmental claims they should prioritize” (27). Increased education could also help mitigate one of the challenges in integrating domestic fair trade in food co-ops, “the perception that farmers/producers/laborers in North America do not face similar injustices as those in the global South” (7). In a time where conventional supermarkets are increasingly selling organic and local products, our report finds that food co-ops are still distinct from these other grocery stores and are essential to advancing domestic fair trade principles. Our report notes that “food co-ops are the ideal venue for educating consumers about domestic fair trade issues” (26). The research also suggests that engaging young adults specifically might be important because “they are the most likely potential consumers and proponents of the movement” (28). It is clear that education and labeling play an important role in changing the way that agricultural products are produced, distributed, and consumed. There, however, is no replacement for good legislation, regulation, and enforcement: “U.S.-based fair trade efforts would benefit from a recognition that labeling and certification can support labor regulation, but cannot replace regulation” (6). The DFTA and our members continually engage in advocacy campaigns because we know that in order to increase fairness and environmental sustainability, we must shift the norms of agricultural production at a large scale. We hope by publishing this report we are able to demonstrate why it’s so important for different sectors throughout the agricultural supply chain to become committed, and stay committed, to domestic fair trade principles. This research is not an endpoint, but a starting place for determining how we can advance the domestic fair trade movement. A member of the HEAL Food Alliance, the DFTA is a non-profit membership-based organization with 35 members spanning five stakeholder groups along the food chain—farmers, farmworkers, retailers, intermediaries (manufacturers, processors, and distributors), and NGOs. The mission of the DFTA is to promote, educate, and advocate for an agricultural production system that meets the sixteen domestic fair trade principles identified by diverse stakeholders throughout the agricultural supply chain. “A Report on Market and Supply Chain Research on Domestic Fair Trade” is part of an ongoing research partnership between the DFTA and CFAT. Learn more here.